This set of 5 little houses each handmade (hand cut, sanded, primed and painted) is perfect holiday christmas village or decoration. 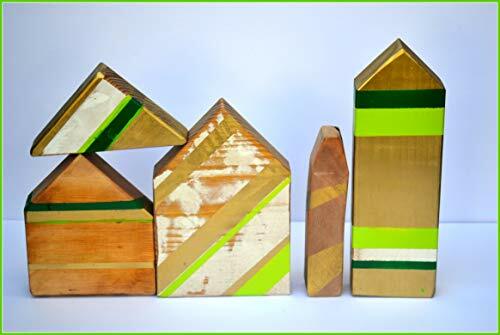 Painted with lime and pine green colors and metallic gold are rustic yet so pretty they make just wonderful simple village or Christmas village display. At Christmas time just put some decorative cotton underneath and some little fairy lights to make them come to life! You can use it how your choose of course, but they are so cute and versatile! Houses are made from 2x4's or 4x8 pieces of reclaimed wood that I hand cut into various shapes. They measure between 4-8 inches tall. They stand by themselves. They can be placed on a windowsill or a mantel. No two pieces are alike. These show signs of wear and paint is meant to be rustic and worn looking. They are varnished with outdoor polycrylic non yellowing and UV protective sealant.